Enjoy these handcrafted fancy Ash studded counter stools as a perfect addition to any home. These stools fit are equally fancy as they are comfortable. This item is from our handcrafted eco-friendly collection. Each piece is handcrafted by artisans in India who create an authentic piece of furniture. Please note each piece is unique. I was looking for backless stools that provided a comfortable seat, durability and style. These stools have all three. I bought 3 for my center island and they fit (they'd fit better if I didn't have the corbels.) 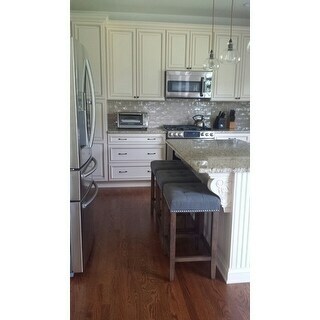 My kitchen is cream but the gray goes very well with it and my stainless steel appliances. The stools do have stainless nail heads around the seat and the kick plate isn't but it's not a big deal because it blends very well with the color of the wood. It's also so low and tucked underneath the center island, you don't even notice the color difference. The seat has very sturdy cushioning so you don't need to worry about it holding someone with some weight and it's firm. They came individually packaged and wrapped with lots of protection. Delivery was quick. Very happy with my purchase! Stool is stylish and comfortable. Height is great for sitting at counter. 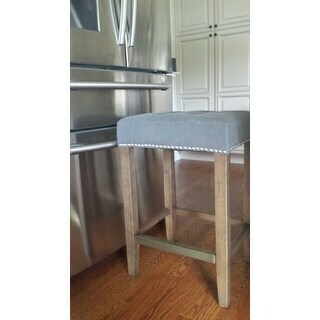 Only complaint is the description of the stool color said “grey” and the stool looks more taupe in color. Exactly as pictured. 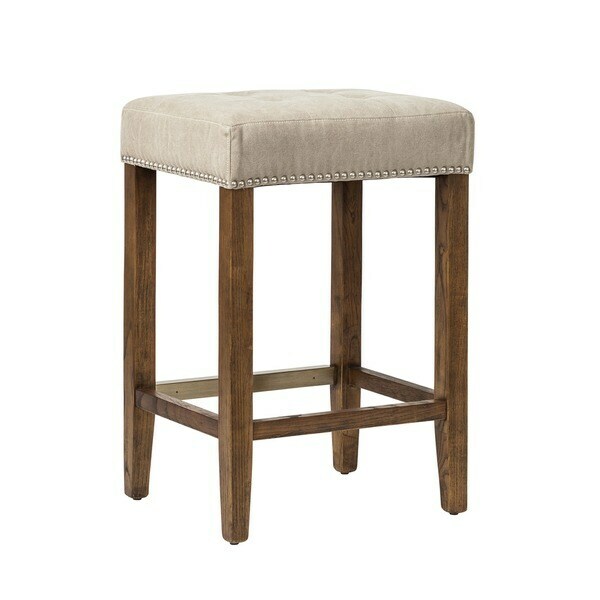 This counter height stool is sturdy and the fabric is heavy duty. It is very pretty and I love the silver nailhead detail. Very good counter height stools. They have very comfortable, thick cushions and the upholstery seems to be very durable. The legs were lighter color-wise than I would have liked, but they are all straight and were easy to do a light sand and apply a darker stain. The legs also have small plastic knobs on the bottom which I had to take off and replace with felt after I found they were scratching and denting my wood floors! 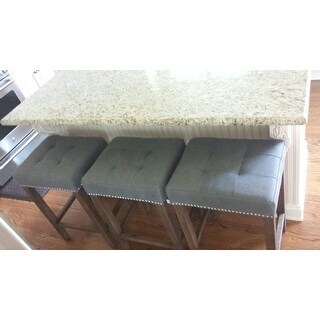 So I do really like the stools even though I had to put a little work into them and I would definitely buy them again if I had it to do over. Beautiful and sturdy counter stool. I have had it for over two years and is has never stain or worn poorly. It is a statement factor for my counter...wish I could had more room...I certainly would have purchased more. Nice, sturdy stools! No assembly. Very happy with this purchase. I purchased 4 of these to go with my new rustic counter height breakfast nook table. They came via **** and each in their own box. The legs were wrapped and the seats each had a special cover. I was very impressed on how nicely they came packed. They are very sturdy and well made. I got the beige color fabric and I love how they look with my decor. I do worry about stains because it's rather light and I have 3 teenagers. I put a coat of scotch guard and will hope for the best. GREAT PURCHASE!! I ordered 3 of these 5 months ago and I love them more every day. I use them daily and they have held up great, with kids and parties! The grey material is very family friendly. Spills clean up easily. When seated, they feel very sturdy and well made. I highly recommend these stools! Very comfortable seat and beautiful dark gray fabric. Kick plate is an extra bonus and blends in nicely with design. Quality product. Very pleased with these stools. They are well-made and stylish. The wood is lighter than expected but works. The kick plate is the main reason I purchased and is great. Will definitely prevent wood from chipping. Sturdy, pretty &amp; holding up well after 6 mo ths. "Is the kick plate gold or silver? In the picture the studs look silver and kick plate looks antique gold." "What is the exact total height of these stools? On one section where it has dimensions it says 24 inches for height. But, under details it says the overall height is 26 inches. I need to know the total height including the cushion seat...from the floor. Thank you." This stool measures approximately 26 inches high. Very attractive, perfect size for small area. "You show two different heights for these. Are they 26 inches high or 24 inches high? Does the seat sink in or is it firm? Thanks!" This item is approximately 26 inches.